The recent Galaxy GOC 2017 Gaming gathering in China brought together some of the industry's biggest players and Chinese reseller partners. As well as the event sponsor, both Nvidia and Intel helped provide substance to the proceedings with explanations of market trends and plans. A new report from Chinese language site MyDrivers shares some of those plans, as disclosed by Intel at the event. Above you can see a photo taken at Galaxy GEC 2017. This is Intel's desktop processor product roadmap from now until the end of 2018. Before looking too closely at the divisions in the chart it must be remembered that the rounded box boundaries represent the edges of the production windows, not market availability. For premium multi-core Intel CPUs, the X-Series processors, it looks like Skylake-X and Kaby Lake-X will continue their reign until at least Q4 next year. After that we should start to see Cascade Lake-X. Though we don't have any transcript of the talk accompanying the slide, the MyDrivers report says Cascade Lake-X will likely be 14nm++ and continue to use the LGA2066 interface and X299 motherboards. Thus Cascade Lake-X will be a Skylake-X refresh. For the mainstream desktop platform more Coffee Lake-S processors (300 Series) will start to flow from production lines early next year. If you look at the production rectangle it looks like January or February will be the time, but according to the notes below the chart we will have to wait until March or April for sales of these parts to begin. Last week we saw a raft of previously unannounced 8th and 9th generation processors leaked via a newly released Aida 64 system diagnostics app. 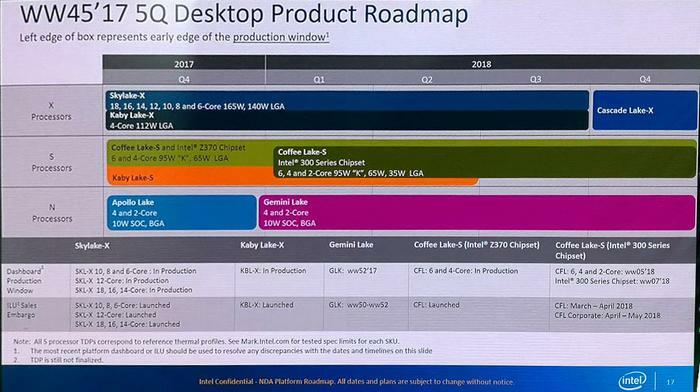 Last but not least, the new roadmap shows that in the low-power desktop segment Intel is readying Gemini Lake as the replacement to its Apollo Lake line. From the description the difference between the generations isn't obvious. We already know that these processors will become the Pentium gold, silver and Celeron chips. It looks like availability of the N-Series chips will start from the last couple of weeks of 2017. Wow, that was one error-laden report. That final sentence is not corroborated by the previous - it says it will likely be fabbed on the same process node and use the same socket. What about architectural changes? Those would have to be really small for this to be a “Skylake-X refresh”, and even if they are, that first statement does not provide the basis to state that as fact. is very odd. 300-series CPUs? There's no such thing. The roadmap clearly specifies "300-series chipsets“ (my emphasis), which only tangentially relate to the launch of future CPU SKUs (although there's an important connection in business terms: no OEM will pay a premium for Z370 chipsets paired with some locked i5 or i3). Omitting the word ”chipset" from the news post makes this confusing and just plain weird. It sounds like all of the CPUs in question will be in the i5-83XX range, which I assume they won't. in the low-power desktop segment Intel is readying Gemini Lake as the replacement to its Apollo Lake line. From the description the difference between the generations isn't obvious. We already know that these processors will become the Pentium gold, silver and Celeron chips. It looks like availability of the N-Series chips will start from the last couple of weeks of 2017. To the first statement: This should be a surprise to noone. The roadmap doesn't point out any differentiators between generations of other product lines either - just TDPs, core counts and sockets (and chipsets for the tiered-launch mess that is KBL-S) - so why should the roadmap for Atom-series/N-series CPUs be different? As to the second: again, no. Pentium Gold are Core (KBL-S) architecture chips, not Atom. Pentium Silver is the designation for Atom-based Pentium chips. As I understood that rebranding, the whole point of it was to differentiate between Gold/Core/“best” and Silver/Atom/“worse”. See AnandTech's report on that: link. Didn't previous roadmaps have 8-core chips? I think yes, but maybe they realized they do not need to push them out, yet. Why bother if your product line is still great, and these up coming variants are better performers anyway, without all the extra heat extra cores displace. When another die shrink occurs, then more cores will arrive.